USC students and faculty watch the 2017 Inauguration on the Media Wall at Wallis Annenberg Hall on Janurary 20, 2017. 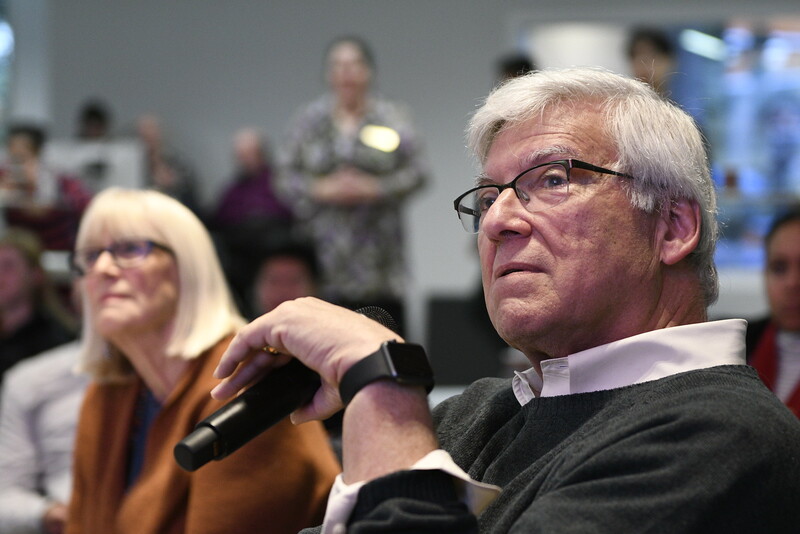 Updated Jan. 24, 2017 1:03 p.m.
More than 40 students and faculty braved time-zone differences and early morning rain to gather in Wallis Annenberg Hall for an informal viewing of Donald J. Trump's swearing-in as the 45th President of the United States. Leading up to the oaths, Bob Shrum, director of the USC Jesse M. Unruh Institute of Politics, Geoffrey Cowan, director of the USC Annenberg Center on Communication Leadership & Policy (CCLP), Justin Wallin, COO of Probolsky Research, and audience members participated in a wide-ranging discussion forecasting Trump’s speech and the possibility of protest. Across the country, USC Annenberg professor Robert Hernandez and a group of Annenberg student journalists were in Washington creating multi-platform coverage of the Inauguration using text, social media and virtual reality.